On the coast where Normandy meets Brittany, Mont St Michel is one of France’s great icons. The village and world-famous Abbey complex stand out high up on a rocky island just off the shore. This UNESCO World Heritage site is one of France’s biggest attractions, with around 3.5 million visitors a year. In 2015 the old causeway was removed and a bridge built, which means that the island is once again cut off from the mainland at high tide with access only by the bridge. There are three different ways to get to Mont St Michel by train, both involving a change, then bus. 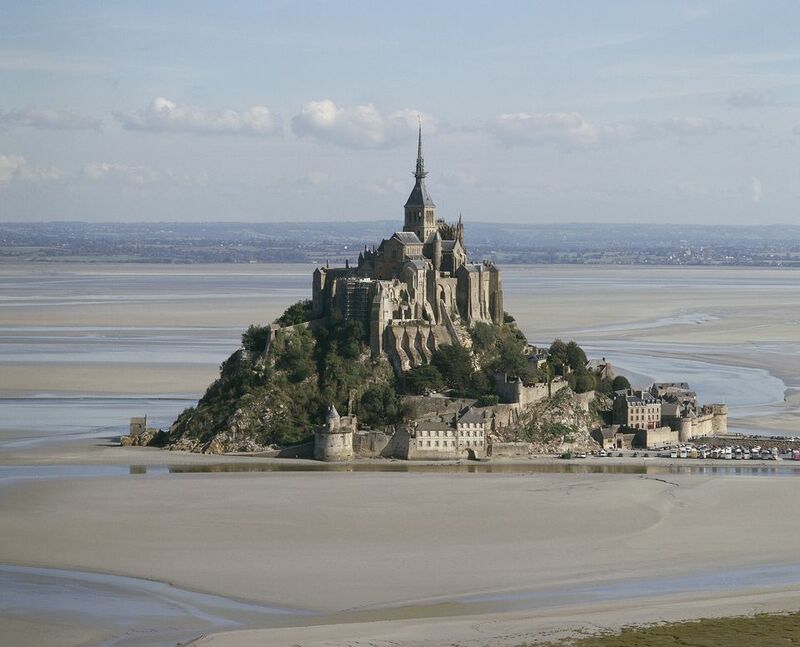 There are no direct trains to Mont St Michel from Paris, but you can check routes to Caen on Rail Europe or if you are coming from the UK, book on Voyages-SNCF (formerly Rail Europe UK). From Caen, take the local train to Pontorson and the bus from Pontorson to Mont Saint Michel. Note that the Pontorson Bus Terminal is now situated by the Tourist Office. There is a free shuttle bus over the causeway to the foot of Mont St Michel. 1. TGV trains to Rennes station leave from Paris Gare Montparnasse Paris (17 Boulevard de Vaugirard, Paris, 14th arrondissement) all through the day. The journey is two hours. Ligne 13: Saint Denis/Universite et Gabriel Peri-Asnieres Gennevillers to Chatillon-Montrouge. At Rennes, change onto the TER train to Pontorson, just 9 km south of Mont St Michel. There is a direct shuttle between Pontorson railway station and Mont St Michel where it terminates at the arrival platform of the shuttles linking the mainland to Mont St Michel, approximately 390m from the ramparts. The shuttle’s timetable is coordinated with SNCF trains stopping at Pontorson railway station. 2. TGV trains to Dol de Bretagne leave from Paris Gare Montparnasse as well and take 2hrs 40mins. At Dol de Bretagne, take the bus to Mont St Michel, taking 30 minutes and operating throughout the day. 3. Trains to Caen leave from Paris Gare Saint Lazare (13 rue Amsterdam, Paris 8) all through the day. Aéroport de Dinard/Pleurtuit/Saint Malo is situated 4 km south of Dinard on D168 in Pleurtuit. It is 45 minutes from Rennes and 50 minutes to Mont St Michel by road from the airport. Ryanair operates between Dinard and London Stansted, East Midlands and Leeds airports. Aurigny Air operates flights between Guernsey and Dinard. The distance from Paris to Mont St Michel is 359 km (223 miles), and the journey takes around 3hrs 30 mins depending on your speed. There are tolls on the Autoroutes. Another option is to take the Brittany Ferry. Regular overnight ferries run from Portsmouth to St Malo taking 11 hours. It's a very good ship, with an excellent restaurant and the crossing is long enough to give you a good night's rest. You leave Portsmouth at 8:15 pm and arrive in St Malo between 7:30 am and 8:15 am. From St Malo, the distance to Mont St Michel is 56 km (35 miles) and the journey takes around 50 minutes, depending on your speed. By bus/coach: Eurolines offers a cheap service from London, Gillingham, Canterbury, Folkestone and Dover to Paris Charles de Gaulle Airport and Paris Gallieni. Six coaches a day; 2 overnight; journey time is 7 hours. The Eurolines stop is at the Paris Gallieni Coach Station, 28 ave du General de Gaulle, just by the Gallieni metro station near the Porte de Bagnolet (Metro line 3, final stop). IDBus: IDBus operates between London and Lille and London and Paris.